Over the course of the past year, anti-fracking activists have repeatedly asked the U.S. Environmental Protection Agency to “reopen” its investigations of potential groundwater impacts from fracking in Texas, Wyoming, and Pennsylvania. In these cases, the EPA originally stepped in to study impacts or even punish producers for alleged groundwater contamination. But, the EPA was forced to retreat from each case based upon a lack of actionable impacts or questionable research and enforcement tactics. The Natural Resources Defense Council (NRDC) has also chimed in regarding the investigations, pushing for EPA to reinsert itself into these cases. According to NRDC president Frances Beinecke, the EPA is using baseless arguments to defend its actions. In order to separate fact from fiction for these cases, Energy In Depth has put together three separate fact sheets, one for each investigation. A summary for each is below. 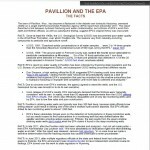 The town of Pavillion, Wyo., has become a flashpoint in the debate over hydraulic fracturing, premised chiefly on a single draft Environmental Protection Agency (EPA) report from December 2011. The report theorized a link between hydraulic fracturing and water contamination, but criticism of EPA’s work from state and federal officials, as well as subsequent testing, suggested EPA’s theory was inaccurate. In response to significant criticism from federal and state regulatory officials, EPA withdrew its draft report from the peer-review process, and turned the investigation over to state regulators. For more on Pavillion, please click here. In 2011, in response to allegations of groundwater impacts in Dimock, Pa., the state Department of Environmental Protection investigated whether oil and gas activity was responsible. The DEP ultimately issued a consent decree with the operator to address concerns, and the agency determined in November 2011 that the operator had fulfilled its obligations under that order. The U.S. EPA agreed in late 2011 that the well water posed no immediate health threats. With no new data (only a petition from Gasland filmmaker Josh Fox to then-EPA administrator Lisa Jackson), the U.S. EPA reversed course and began a high-profile investigation that attracted significant attention from the news media and anti-fracking groups. 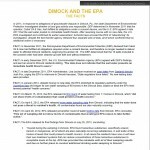 The EPA released four sets of sampling data, and ultimately concluded in July 2012 that its earlier assessment was indeed correct, and no threats existed that required additional action. Activists have accused the EPA of “abandoning” its investigation, despite the fact that the agency completed its investigation, releasing hundreds of pages of sampling data to the general public. For more on Dimock, please click here. 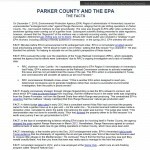 On December 7, 2010, U.S. EPA Region 6 administrator Al Armendariz issued an unprecedented “endangerment order” against Range Resources, alleging that its gas drilling operations in Parker County, Tex., had caused methane to enter groundwater. The case was brought to EPA after video surfaced of a landowner igniting water coming out of a garden hose. Subsequent scientific testing, however, proved that the methane was a naturally-occurring variety, and a state investigation determined gas drilling was not to blame. Emails, which were later made public, also revealed a “strategy” to get EPA involved months before the order was issued, including utilizing a friendly audience in Armendariz, who tipped off the activists about the order before it made the news. With a mountain of scientific evidence showing EPA’s order to be baseless, the EPA withdrew the order in the spring of 2012. A few weeks later, Armendariz was forced to resign after video surfaced of him bragging that his method of regulating the oil and gas industry was similar to how the Romans used to “crucify” villagers. For more on Parker County, please click here.